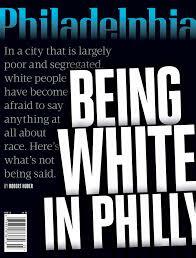 The article, written by Bob Huber, a white man, describes the experiences of white people who live in racially mixed neighborhoods in Philadelphia. The story garnered plenty of attention since it appeared at the beginning of March especially since Mayor Michael Nutter got a hold of it. On Friday, Nutter sent a letter to the city’s Commission on Human Relations in response to the article. In his letter, Nutter claimed the article had a “disgusting tone” and criticized its “collection of disparaging beliefs and negative stereotypes.” He also claimed the story “used isolated negative experiences” and made “generalizations” to portray African Americans as lazy, irresponsible and criminal. Nutter requested that the city’s Commission on Human Relations conduct an “inquiry” into the state of racial issues in Philadelphia. Any article about race will spark a debate. The title of this article is quite provocative. Unfortunately, alot of people will assume what the content of the article is and dismiss it outright because of the title. I actually thought it was a pretty good article. It talks about the complexities of race and talking about race. We can't get so mad when we want people to talk openly about race and say something seemingly offensive. The author didn't say anything that we don't already know. All he did was talk about his internal conflict and he gave the accounts of what others said to him.